Upon its initial 1974 release, IT’S ALIVE was a box office flop, due to what director/producer/writer Larry Cohen believed to be poor marketing. It made money overseas, however, and Cohen convinced new management at Warner Brothers to re-release the film in 1977 with a new campaign. Cohen was right, as IT’S ALIVE went on to gross millions against its original $500,000 budget. Two sequels followed, both directed by Cohen (BLACK CAESAR), and a 2008 remake, which nobody gives a damn about. 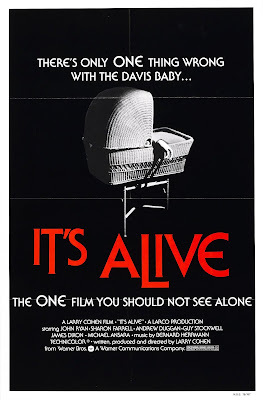 Unique and in questionable taste, IT’S ALIVE is certainly the best horror movie ever made about a mutant baby who crawls about killing people. Like FRANKENSTEIN and KING KONG, the monster is humanized in the storytelling and presented with sympathy, even while it’s slaughtering. Intelligent screenwriting presents two sides of the issue. One faction, including Los Angeles law enforcement and the baby’s father (John P. Ryan with a strong dialed-down performance), wants to destroy the killer infant. Another, led by curious scientists (including LANCER patriarch Andrew Duggan) who want to study the phenomenon, wants the baby captured alive. So does its mother (Sharon Farrell), who doesn’t see her son as a monster, but merely a confused child looking for love from its creator, just like Frankenstein’s monster. While the concept is campy on the surface, Cohen directs his actors to play it straight, resulting in genuine chills and thought-provoking themes of intolerance, ecology, and the power of the family unit. Opening scenes are filmed in a realistic documentary style. Perhaps that was done to help the audience accept not only the outlandish concept, but also the characters’ acceptance — nobody ever questions that a mutant baby killed a whole operating room of medical personnel. Both Ryan (DEATH WISH 4) and Farrell (LONE WOLF MCQUADE) tended to ham performances, but are properly restrained here, which helps sell the premise (give Ryan extra credit for a hell of a Walter Brennan impression). Rick Baker (AN AMERICAN WEREWOLF IN LONDON) created the monster child, which is shown infrequently (probably a wise decision on Cohen’s part, though frustrating for the viewer), and Bernard Herrmann (PSYCHO) composed the score. Ryan, Duggan, and Cohen regular James Dixon as a cop returned for the sequel, titled — what else — IT LIVES AGAIN.